Jimmy Aidoo continues his series of previews on the African teams at the U-20 World Cup in New Zealand, profiling Les Lionceaux of Senegal. Joseph Koto is a name mentioned with a tinge of skepticism by some in Senegal. He was the head of the Teranga Lions in the run up to the AFCON 2012 and was kicked out of the job barely four months into his term after he oversaw a series of poor results in the qualifiers. He took charge of Les Lionceaux and had a roller coaster ride at the 2014 African Youth Championship which they hosted. Notably, his team left it late against Congo when it seemed all hopes of a World Cup berth was all but over. 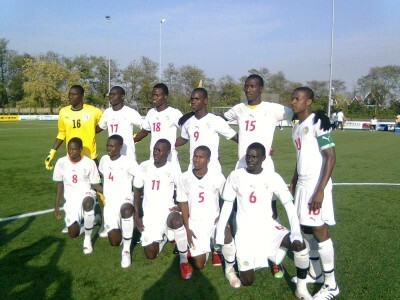 In a strange turn of events, substitute Sidi Sarr scored 2 goals with only three minutes left on the clock and with the result in the other game played concurrently involving Nigeria and the Ivory Coast playing into their hands, Senegal qualified for their first ever World Youth Championship; snatching a semi-final place from the jaws of yet another disappointing group stage exit. Their fairytale continued into the semi-finals as they defeated a resolute Malian team only to end the tournament in the exact same way they started it- a defeat to a superior Nigerian team, this time with a lot more complimentary score line. Senegal play a refreshingly attacking brand of football led by prolific midfielders Ibrahim Wadji and Sidi Sarr, both of whom made the AYC team of the tournament. Les Lionceaux are unreliable upfront but the real worry is at their rear as they let in a whopping 10 goals in five matches. Koto will be looking to bolster is squad with an injection of a new face or two, especially in the problematic heart of defence. Qatar are making their return to the FIFA U-20 World Cup after a 20-year absence, courtesy of winning their maiden AFC Asian U-19 Championship crown in October 2014. Qatar’s Spanish coach Felix Sanchez built his team for the Asian finals around a core of Europe-based players, among them striker Ahmed Al Saadi and midfielder Ahmed Doozandeh, both of whom play their club football for Eupen in Belgium. While Al Saadi top-scored in the tournament with five goals, Doozandeh made off with the Most Valuable Player award. Meanwhile, forward Akram Afif found the back of the net in every game in the knockout phase, including the final. Mirroring the philosophy of the senior team, Colombia’s game plan is based on controlling possession and smart movement. This combination prevents the defence from being overworked and allows the side to conserve energy by not having to chase games while also making it possible to get plenty of players into attacking positions. This was evident in Uruguay, where they peaked at the business end of the competition, had one of the best defensive records (conceding just five times in nine matches), and boasted six different scorers on the way to racking up 12 goals. The squad oozes quality. Goalkeeper Alvaro Montero and central defender Juan Quintero are both rocks at the back. Key figures further up the pitch include attacking midfielders Brayan Rovira and Jarlan Barrera and forwards Rafael Borre and Jeison Lucumi. The latter was the team’s top scorer in qualifying with four goals. As they showed at the European Under-19 Championship, and with no little panache, Portugal are a skillful, attack-minded side that are nevertheless strong in every department. Their front line was particularly impressive in Hungary, never more so than in the 6-1 defeat of the host nation in the group phase, a game in which Andre Silva became the first ever player to score four goals in a European finals match in the age group. Another of the team’s standout performers is forward Marcos Lopes, also known as Ronny Lopes. Currently on Manchester City’s books, he was loaned out to French side Lille at the start of the 2014/15 season and wasted little time in making an impression in Ligue 1, despite being only 18. This will be their very first appearance on the world stage and they have been thrown into the deep end with Colombia, Portugal and a capable Qatar. This could be either one of these two possibilities; a very good run or a getting-to-know-you exercise. With an unimpressive camping base, Les Lionceaux will have their job well cut out for them when the tournament starts on June 30. I am really not sure anyone has enough brass in the chop to bet on a Senegal quarter final appearance. Senegal is the Group C guys, with Portugal, Colombia and Qatar. Rectified, thanks – editorial mistake!